I enjoyed Vincent and The Doctor a little less this time than I did when I first watched it. I still like it, even with quibbles. 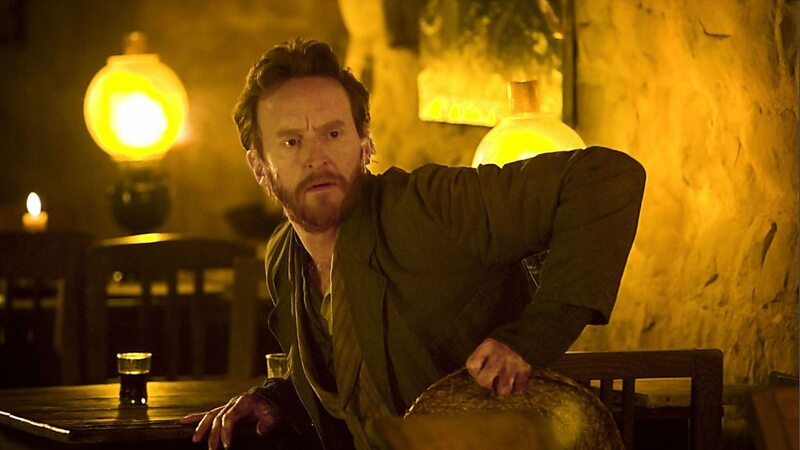 It benefits from a magnificent performance from Tony Curran as Vincent van Gogh at its heart. It helps that he does look pretty like how van Gogh looked, which is nicely signposted in that little moment where the Doctor holds up a van Gogh self-portrait in front of Curran's face and you find yourself thinking how alike they are. It's the strength of Curran's performance that enables the story to hang together as an emotional piece. After all the monster in this, the poor lost, blinded Krafaysis is an aside. A thing included to make this feel like a normal Doctor Who story when it isn't. It's a Richard Curtis* story about van Gogh and depression. And about how a great man. A great and damaged man can twist his pain into something so wonderful as van Gogh's paintings. I've been to the Musee d'Orsay in Paris. If my truth be told I think, there's greater artwork in there than in the Louvre but everyone is a critic these days. I had never seen a van Gogh 'live' until then but when you do it is a sensuous experience of the first order. I never realised that colour could be so...colourful. The colours in his paintings fizz with energy and you find yourself wondering how people missed it at the time. How can you not see that this man is doing something astonishing? And, of course, this is now turning into a review of van Gogh's artworks and a consideration of what van Gogh means as an artist. But then this story does that too. I love the scene where the Doctor, Amy and van Gogh lie on the ground in the night, looking up at the sky and van Gogh describes what he can see. You don't often get moments of great poetry in Doctor Who but that is one of them. I'd watch Vincent and the Doctor just for that scene really. That and the scene where we get an insight into van Gogh's depression when the Doctor tries to hurry him along. Again, Curran is truly heart-breaking in this scene. It's a little uncomfortable watch because it feels so true and the Doctor really, really doesn't know what to do to help. Matt Smith is good in this, except for his irritating childishness when van Gogh is painting. It's almost funny but the idea that the Doctor must behave like a child in these circumstances doesn't entirely ring true. Especially as by this point you'd quite easily believe van Gogh would just wake him one for jabbering whilst he was trying to work. Thankfully the Krafaysis turns up in time for us to have a bit of fun. The poor scared Krafaysis. Doctor Who doesn't often consider fear when people die. Understandable really because with the amount of dying that goes on in Doctor Who it would become a completely different and rather bizarre programme if it did. But the Krafaysis is afraid and dying alone. Abandoned. Blind. Then - as a reward - the Doctor and Amy take van Gogh to the future. To the Musee d'Orsay. To show him how he's valued in the 21st century and for a moment Doctor Who goes all Grey's Anatomy. I'm not sure really who this reward is for. The Doctor must know that van Gogh will still kill himself. Perhaps he's still trying to make it up to Amy for Rory's death that she doesn't remember but perhaps the real reason is revealed in the rather magnificent speech the Doctor gives Amy about life being made up of good moments and bad moments. Van Gogh's suicide, despite his apparent validation, shows that there are some corners of the universe that even the Doctor cannot reach. Add to that some rather magnificent design work by the art department that makes some of van Gogh's paintings really seem to live: the café, the interior of van Gogh's bedroom etc and there is some greatness in this story but for reasons I'm not quite sure of it affected me less this time than before. Perhaps I'm just getting more cynical in my old age. I do know that once more Doctor Who steals the creative credit from an artist - see my quibbles previously in the articles about The Shakespeare Code and The Unicorn & The Wasp (and my comments about Mary Shelley in Big Finish too) by making Amy give van Gogh the Sunflowers idea. Stop doing that producers of Doctor Who. It might be funny, but it takes credit away from truly brilliant people and makes Doctor Who more like Goodnight Sweetheart. So, stop it. So, to conclude in as sudden and as artificial way as possible I like this story a lot but there's something that I can't quite put my finger on that prevents it from being labelled a roaring success. I think it would have been a better story without the Krafaysis, but then would it have been a Doctor Who story at all then. Oh, as it has just popped into my brain, I did like the Scottish accent/Netherlands joke and the 'ultimate ginge'. *I could waffle on about Richard Curtis, but I think he's had enough comment to last a lifetime so I'm going to pretend for the purposes of this interview that he's just a jobbing Doctor Who writer. We can talk about Blackadder, Four Weddings and a Funeral etc another time. Next thing you know Doctor Who will be trying to get Tom Stoppard to write an episode.